The beauty of yoga blocks is that it can aid in the proper alignment for all yoga practitioners. Many people feel that using yoga blocks reveals that you are not very good at yoga. Using them is a sign of weakness. When in fact, the opposite is true! The use of blocks is for the exact reason in the above quote. 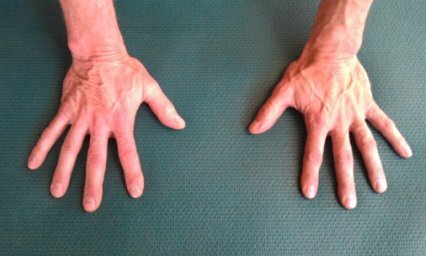 It is almost impossible to have a calm, steady breath when you are out of alignment in a yoga pose. Therefore if you are committed to getting the absolute most out of your yoga practice, you will chose to use the block, if you are struggling to hold a pose. You can tell if you need a yoga block (If it is suitable for the yoga pose) if you are unable to hold a slow, calm and steady breath! Easy to determine, don’t you think? As a yoga teacher, as soon as I see a student with a look of over-concentration on his/her face, I know they are pushing too hard to maintain a yoga pose. So I always give them a modification as soon as I witness the pushing. That modification usually involves yoga blocks or sometimes a yoga strap. If you are constantly pushing or struggling or worst of all, holding your breath, so that you can hold a yoga pose, you are actually NEGATING the benefits of yoga! So please, use your studio’s yoga blocks without embarrassment. Not only will your body-mind-soul reap the most benefit, but also your yoga practice will improve much more quickly! So let’s get started looking at some great yoga poses modified by yoga blocks to achieve the best alignment. My husband graciously agreed to let me use him as a model. He is a very athletic, 50+ man who has neglected his stretching and flexibility! He is now paying the price, as his posture is suffering after years of hunching over a computer. His legs, mostly his hamstrings are very tight. However, in the three months that he has been practicing beginner’s yoga poses, he has dramatically changed his body already! I am so proud of him! The first pose that we worked on was sitting properly in the cross-legged position, also known as the Easy Cross-Legged Pose. This position is often referred to as sitting "Indian style." This is a modification of the classic lotus position, used primarily for meditation. Since he has really tight hamstrings, even the cross-legged pose was very difficult for him. 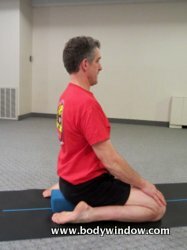 If you could see him in the crossed-legged pose without the yoga block, his knees would be way up in the air and he would have a forward leaning posture. (This is very very common. Most people find it difficult to even sit on the floor in the easy pose and keep an erect spine for more than a few minutes). 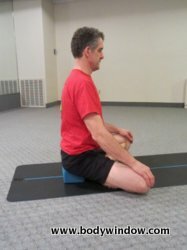 The easy solution for the easy pose is to sit on a yoga block, like the picture shows. He could achieve a nice erect posture just by using the yoga block. A similar pose is the Hero Pose, the pose I often sat in as a child. Again the same principle is applied to get his spine into proper alignment. He looks pretty good doesn’t he? Another "easy pose" is the Child’s Pose. But because my husband's shoulder mobility could be better, he was more comfortable if he was raised up and sitting on a yoga block. Notice that I made sure his feet were toe to toe, forming the shape of a triangle with the block. This aided him to widen his knees and hence was more comfortable in this yoga pose. Over the last few months of practice, and opening up his shoulders more, he can actually do the child’s pose quite comfortably now without a block. But he needed to start here first. The Mermaid Pose, another sitting pose requires the spine in an off-balance position when the legs are off to the side. It is much easier for almost everyone to keep their spine in a nice alignment, by raising the one hip as shown in the picture. The blue yoga block is hard to see on the blue mat, but it is there under his left hip. While everyone might not need a yoga block, a folded blanket makes almost all of us more comfortable. 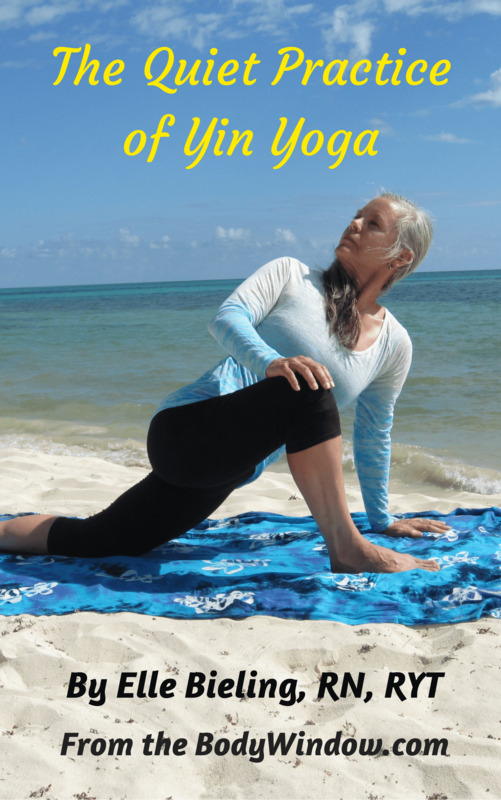 The Pigeon Pose, shown below, is a tough one for everyone with tight hips and legs. Even after years of practice this one is very difficult for me. It is because most of us spend the majority of our days with hips flexed, sitting at a computer desk all day. Tight hip flexors are the result. The pigeon pose stretches our hips both ways. 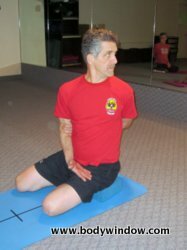 You can see that my husband looks really tight in this pose, even with the yoga block under his hip. Without the block he may not have been able to do the pose at all. I also worked with him on the Triangle Pose. We first tried a modified triangle. The modification is in the bent, forward knee. A sort of cross between the triangle and the extended side angle pose, shown farther down. He did pretty good, but was able to do a full triangle pose with the assistance of the yoga block. We tried the full triangle pose first in the classic position with the block outside the foot (see just below on left). He was barely able to touch the yoga block in the highest position with the tips of his fingers. He was able to keep his tight legs straight, which is a vast improvement from just a few short months ago. He looks like he is in pretty good alignment. Not perfect, but pretty darn good for a "stiff old man" as he calls himself! In a few more months of practice, he will no longer be a stiff old man, I assure him and you all! Then we tried him in a variation (below, right) to open his chest up a bit more and perhaps make it easier to reach the yoga block. I placed the block on the inside of his foot. I think he looks better in the traditional pose. What do you think? Increasing in difficulty, we tried the Extended Side Angle Pose next. I think he did this one the best. That nice extension in the side of his body is newly acquired. He is opening his body and his mind to the newness of the inner calm very nicely! His inner work is showing in all things of his body-mind-soul and he will be the better person for it as he ages. The Warrior III Pose is a difficult one. It is really not a yoga pose for beginners. However, in order to work up to the pose and get the feel of the balance required, a good way to do it is with the blocks, see below. My husband was able to do the pose with two blocks, one under each hand. He was not able to get the right extension and balance in order to do it with just one block, so I am demonstrating it in the next photo below. The Full Warrior III Pose, shown below, is with the arms extended in front as I demonstrate. I picture this without a block so you understand the goal. If you start with the two yoga blocks, slowly work up to only one, then you can try raising your arms out in front of you. In order to do this pose you need to practice a lot and be very calm and focused, utilizing your 7th Chakra energy. However, you will still reap many yoga benefits, even if you are never able to raise your arms! The final pose with a yoga block, the Half Moon Pose is a tricky balance pose. I need to demonstrate it since my husband was unable to do it. It is another one that takes a lot of practice to accomplish. He will get it eventually, I am sure! The block definitely makes it easier! 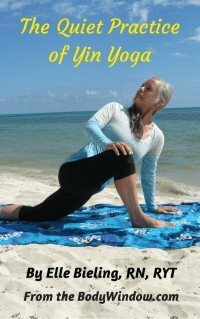 If you are not a believer that yoga can change your body, regardless of your age, this article should help you re-think your position. My husband has never done a day of yoga in his life before the age of 55. He is improving by the week and feels so much better as a result. 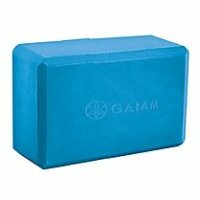 If you would like to get started with yoga yourself, I would highly recommend you obtain your own pair of yoga blocks. It will help you enormously. 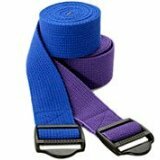 Also get a yoga strap and read my article on how to use it at The Yoga Strap. Many yoga studios offer classes for beginners and beyond that utilize these yoga props. A good yoga teacher will modify your poses using these props when indicated. May you find healing of your body-mind-soul as you use your yoga blocks to learn proper alignment! May you sink into your block, and love the support! May you find inner strength and calm that yoga can provide for you! More Yoga Tips for Beginners and Everyone!